German author; born at Breslau Feb. 20, 1819; died at Berlin Jan. 6, 1891. When only nine years of age he was baptized. Educated at the gymnasium at Glogau and the universities of Breslau and Berlin, he received the degree of Ph.D. in 1843. As early as 1836 some of Löwenstein's poems had been printed in the journals of Silesia; and his reputation was established by the appearance in 1846 of his "Der Kindergarten," a collection of songs for children. In 1848 he with David Kalisch and Ernest Dohm founded the well-known "Kladderadatsch," of which he became one of the chief editors. 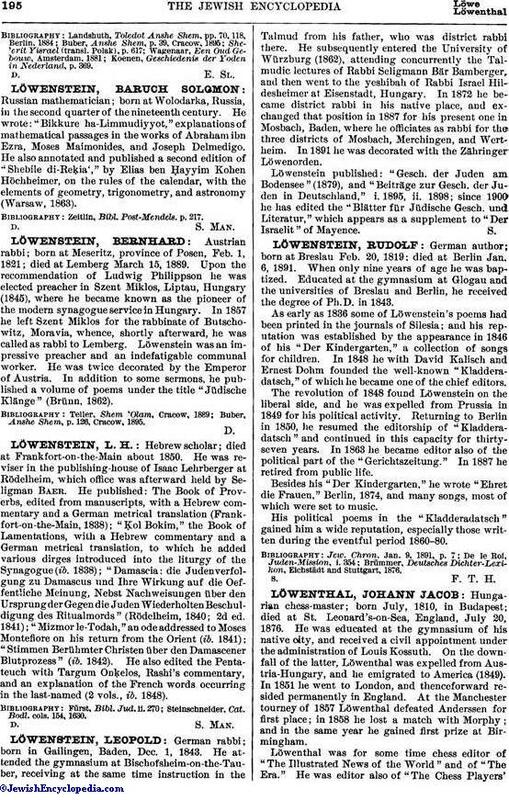 The revolution of 1848 found Löwenstein on the liberal side, and he was expelled from Prussia in 1849 for his political activity. Returning to Berlin in 1850, he resumed the editorship of "Kladderadatsch" and continued in this capacity for thirty-seven years. In 1863 he became editor also of the political part of the "Gerichtszeitung." In 1887 he retired from public life. Besides his "Der Kindergarten," he wrote "Ehret die Frauen," Berlin, 1874, and many songs, most of which were set to music. His political poems in the "Kladderadatsch" gained him a wide reputation, especially those written during the eventful period 1860-80. Brümmer, Deutsches Dichter-Lexikon, Eichstädt and Stuttgart, 1876.